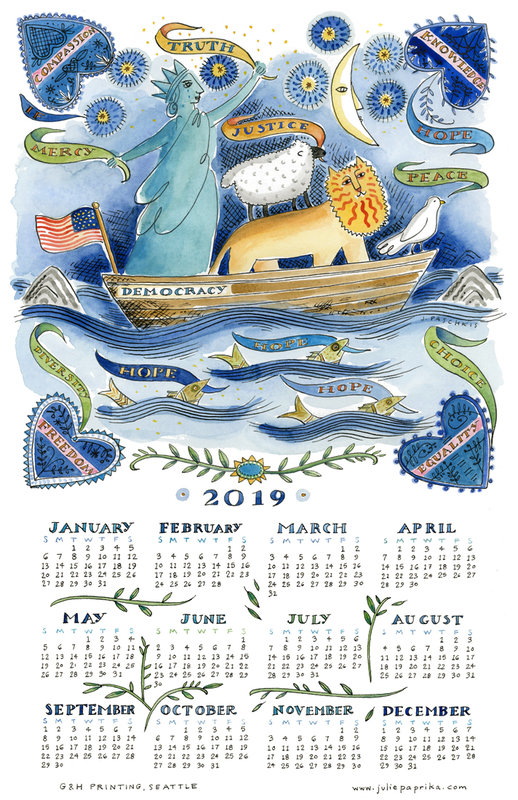 I have created a 2019 calendar which I am selling to benefit the ACLU. You can buy 2019 Hope Calendars by clicking this link at www.juliepaprika.com. The calendars cost $12 each. All $12 goes to the ACLU. You will pay for tax and shipping ($4 shipping charge for 1 or 2 calendars). If you buy 5 calendars or more I will pay for shipping. I made similar calendars for 2017 and 2018. In total we raised $15,750.00 for the ACLU over two years, thanks to you. Here are links to the 2017 and 2018 calendars, with records of the deposits. I hope that together we can raise even more this year. Please give a calendar to everyone you know! The calendars are 11″ x17″, printed on heavy stock. All of the printing is generously donated by Kevin Upton of G & H Printing in Seattle. This project would not be possible without him. My politics are left leaning. I hope that my right leaning friends and I can continue to communicate and share our love of this country. We are all in this boat together. Do you teach classes? If so are you ever in the Oregon area. Thanks for your message. I don’t teach now. Maybe someday! Do you think that you will come to Arizona? I have no plans for Arizona in the immediate future. Maybe someday! What about long-distance coaching/mentoring? Might you have time for a little of that? Needing some direction with my work and love what you do. Thanks for your message. I don’t want to do any official mentoring or coaching, but I would be happy to have a phone conversation with you about your work. I am out of town until Sunday. If you would like to talk please email me next week at jpaschkis@comcast.net and we can figure out a time. Do you have a quilt show coming up near LaConner? Enjoyed your Edison exhibit at i.e. gallery!